If Walt Disney were still alive he'd be into zombies right now, I'm almost positive of that. There'd probably be some sort of Zombie Island ride, or a Zombie week with Zombie fireworks or at the very least a Zombie stop at Epcot where they'd serve chicken nuggets in the shape of brains or perhaps a tasty soup/bread bowl combo, with the bread made to look like a human head so that when you take the top off it looks like you're sipping...well you get it. Zombies are cool now, they have been for a while. I mean sure, 2008 belonged to the Vampire, but the Zombs have never really disappeared. After all, they are the undead. The likelihood of their just disappearing is almost nil. With that being said, Hollywood, the second happiest place in the world behind Walt Disney World, at least that's what I sense, is going to make as much bank on as many trends as possible. 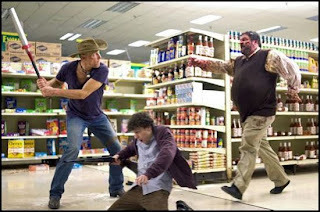 Choosing a Halloween-tastic October release Zombieland is kind of the "sleeper" hit of the fall. There wasn't a ton of buzz, until about 3 weeks before the film's release and then it just sort of exploded, and for good reason. It's a good, fun, solidly written movie. Here's the short of it: The apocalypse has occurred, sort of. Instead of the 4 horses and the earth in ruins, it's come in the form of the Zombie plague, a derivative of "mad cow" disease. 4 people (Woody Harrelson, Jesse Eisenberg, Emma Stone and Abigail Breslin) appear to be the only people left in the U.S., (or at least on the West Coast) and their attempts to survive are chronicled over an 81 minute span of time. It may not sound like much, but that's the beauty of it. The simplistic plot leaves enough wiggle room for fantastic writing and the comedic/sardonic talent of the foursome cast does not disappoint. Jesse Eisenberg is a standout for his deadpan delivery while there is perhaps no role as tailor made for an actor as Woody Harrelson's Tallahassee since Morgan Freeman played the President. It's one of those roles that just fits, a lot like a pre-2003 Britney Spears mid-riff top. There's gore for the people who went in looking for a horror movie, enough flirtation and sweetness to keep the girls in it, and enough guns for the boys to sit through too. There's also an absolutely stand-out, howl with laughter cameo, that if you haven't heard about it, I won't ruin it for you here. How this movie managed to keep that quiet for so long is a feat in and of itself. The pacing is quick, the style is quirky and though, resemblances to Shaun of the Dead will be difficult to stop, they are both zombidies (zombie comedies), while there's a slightly more serious, horror-genre feel to Shaun of the Dead, Zombieland is really more like a straight comedy/buddy road trip, that happens to have zombies. It may not be the ultimate Zombie Survival Guide (which I've still yet to read, but been inspired to pick up now) but it's a hell of a tilt-a-whirl (sorry, I couldn't help the amusement park reference...again).